I wanted to wish all of you safe holidays. Meant to submit these a long time ago. Here's one of 3 personally designed werewolf cards I've received from BlueEyesWolf. Thanks, BlueEyes! This is a Birthday Card from 1995. 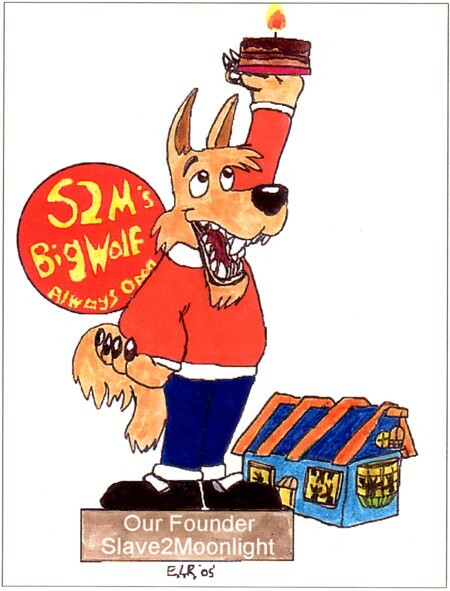 Here's last year's Christmas card from BlueEyesWolf. 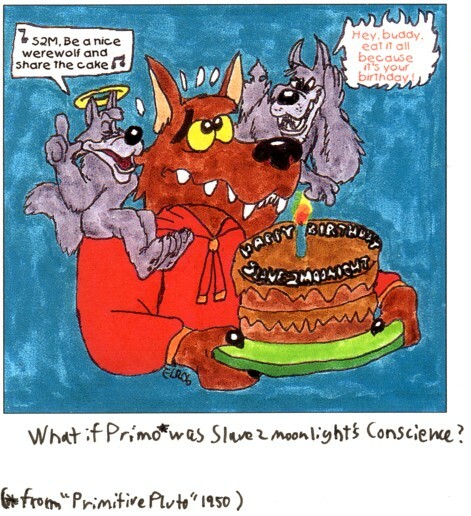 Here's the birthday card I received from BlueEyesWolf last April. The wolf angel and devil on my shoulders are an inside joke for the big Disney fans here like BlueEyes and myself. 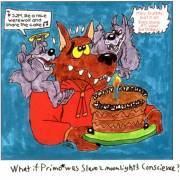 They're played by Primo, the primitive side of Pluto's personality. Great work, Blue! The Werewolf Cafe: Hello Stephen, first of all, thank you so much for doing this interview for The Werewolf Cafe website. I read through issue #0 and #1 of "Nightwolf" and Davey is a very complicated character with quite the werewolf curse, it's a very interesting story so far. Are you a werewolf comic book, book or movie fan yourself? S. L. A.: Not indiscriminantly. I really liked the movie "Wolf" a lot, with Jack Nicholson and Michelle Pfeiffer. I also liked "Ginger Snaps"; I thought it was brilliant. 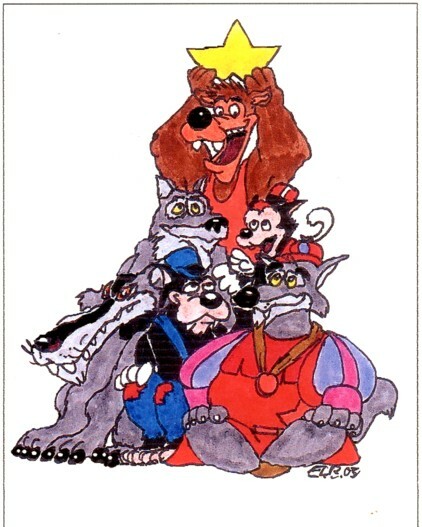 Beyond that, I never really got into the werewolf comic book characters of Marvel or DC, I thought they were uninspired. 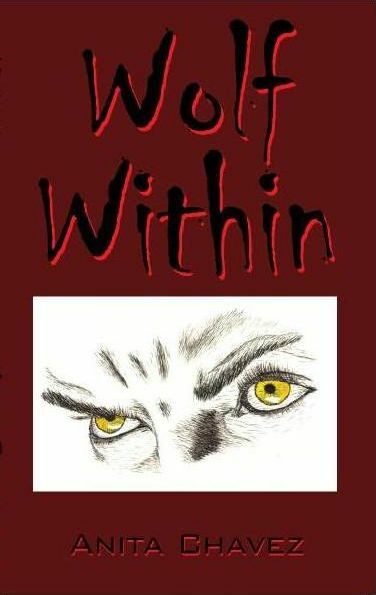 The W. C.: When you write, are you influenced by any werewolf legends, stories, movies, books, comics, actors or etc.? S. L. A.: Except for "Wolf", which really did open my eyes to a new way of looking at the werewolf, I would say no. I'm more influenced by things outside of the realm of werewolves. The W. C.: Now issue #1 part is part of an initial 5 part mini-series titled "NightWolf: The Price". Will there be another mini-series after this one? 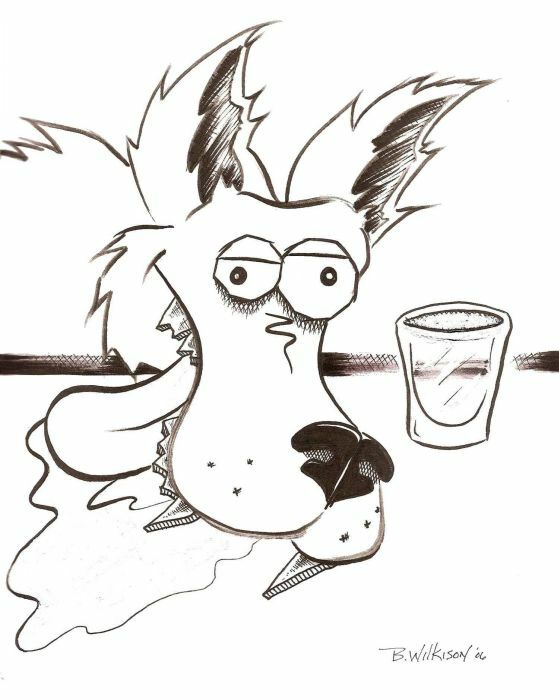 S. L. A.: Actually, my company, VLE Comics, will begin a monthly, full color Nightwolf series, which will be broken up into story arcs as well as ongoing storylines. We hope to debut it by Comic Con in San Diego at the latest. The W. C.: What months are the issues planned to be out in comic book stores? S. L. A.: #2 should hit this month, September, #3 in November, #4 in January, and #5 in March. The W. C.: Nice artwork in the comic by artist Nick Marinkovich. How does everything work out regarding being part of a writer and artist team? S. L. A.: I write the script and email it to Nick, and he does the art. The key thing is establishing characters...what they look like, etc. He did character studies and sent them to me, and there was a little back and forth until we nailed it. For example, I felt Kip, Davey's younger brother, looked a little too old in #0, so I asked Nick to fix that for #1. The W. C.: When did you originally come up with the concept of the story and start writing "Nightwolf"? Are you enjoying seeing your comic book out there in print now? How has the response been so far? S. L. A.: Well, I came up with a character called Nightwolf back in the 1970s as a kid. He was just one of a hundred or so characters I came up with. 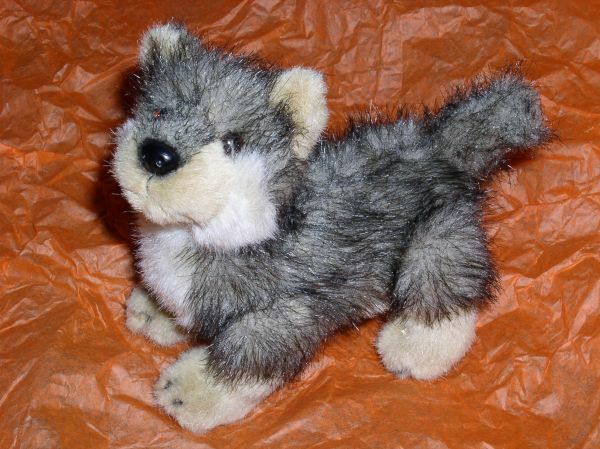 It wasn't until later that I made him a werewolf. I wrote it originally as a screenplay in 1996, got some interest in Hollywood but was told there needed to be a comic book if anyone in Hollywood was going to be really interested. I love having the comic out there, it is hugely gratifying that it has been so well received so far, considering it just came out. Great reviews, the fans really seem to dig it. Being a fan myself, going back to the mid-1970s, I feel like I know what fans want. The W. C.: Any interesting or fun stories you can share with us as they relate to the "Nightwolf" comic? S. L. A.: At Chicago Wizard World I walked into a sports bar after the con for some dinner, wearing my Nightwolf t-shirt, which is just the logo (without the name Nightwolf), and someone pointed to me and yelled: "Nightwolf!" That was cool. The W. C.: What upcoming conventions can people can find you at? S. L. A.: Dragon Con is my home town con, so I go every year. We'll have a table in the Small Press area at NY Comic Con, maybe Mega Con in Orlando, Heroes Con in Charlotte, Comic Con International in San Diego, probably Chicago again. We'll also be at Necronomicon in Tampa in October, which is more of a general sci-fi convention. I might try Archon in St. Louis, I hear that one's fun. If we can swing it, we'll try to go to Baltimore, Toronto, Pittsburgh and Seattle, too. The W. C.: Do you have a website or websites where people can keep up with "Nightwolf"? S. L. A.: www.VLEComics.com, and there's also a Nightwolf mySpace. 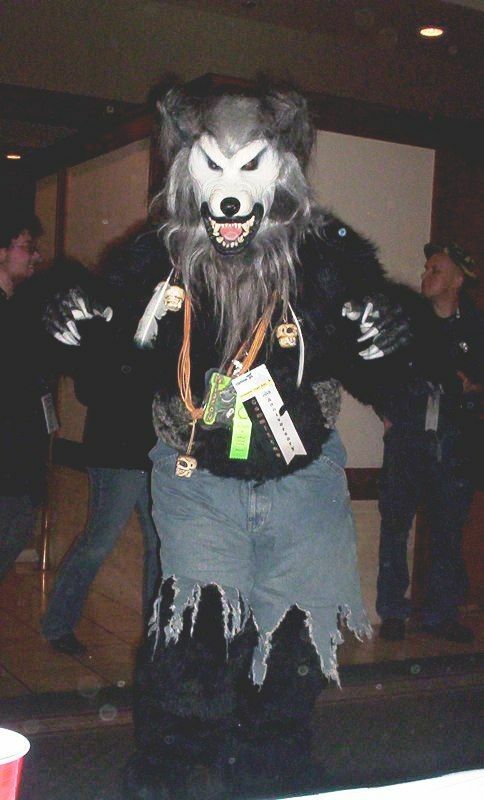 The W. C.: Here's a question from one of the Forum Members on The Werewolf Cafe site, he wanted to know: "Will Nightwolf always have trouble controlling his wolf form?" S. L. A.: Maybe, maybe not! I intend to play with that as the series progresses and the character evolves. The W. C.: Thank you so much for your time and we wish you much success with "Nightwolf". Turns six today!!! Thats right kids The Magazine For All Things Horror made its world debut on this date at The New York World Comic Book Convention. Now with same 28 issues behind us we look forward to the years ahead. We thank you all for being with us over the years in one form or another. Some of you were writers or artists and some have carryed the magazine on your websites and bookstores. Some of you came to our Halloween Horror Shows Blood Fest and many have hung out with us at horror conventions. Thanks for helping this magazine be what it is over the past six years and lets make BMR rule the world! As a side note BMRs spin off publication Werewolf Magazine is now being featured on the very cool website www.werewolfcafe.com so check it out there. 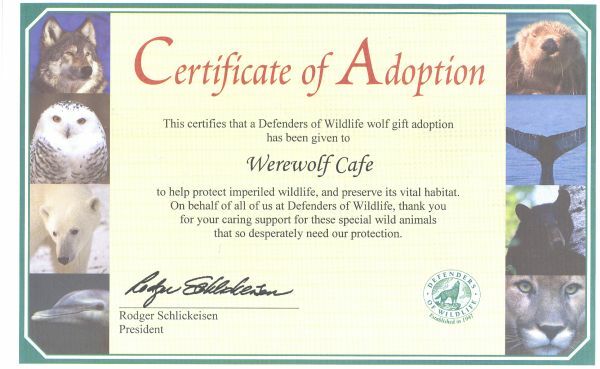 I "adopted" a Defenders of Wildlife wolf in the name of "The Werewolf Cafe." Please check out their award winning website at www.defenders.org for more information about their organization. The beast is on the hunt and Werewolf Magazine has him. Meet the Werewolf of London the very first! Universal werewolf movie even before the Wolf Man. Lots of short stories and articles on the greatest monster there ever was...the werewolf. Look for Werewolf Magazine issue #4 on sale at Shocklines.com and Projectpulp.com by the next full moon. Back issues are also there as well. Bewhere The Night Beast! Thought you guys might enjoy these pages and maybe go so far as to order the book if you're into comic books. Here's the link.